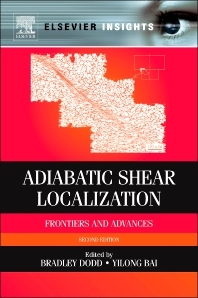 Adiabatic shear localization is a mode of failure that occurs in dynamic loading. It is characterized by thermal softening occurring over a very narrow region of a material and is usually a precursor to ductile fracture and catastrophic failure. This reference source is the revised and updated version of the first detailed study of the mechanics and modes of adiabatic shear localization in solids. Building on the success of the first edition, the book provides a systematic description of a number of aspects of adiabatic shear banding. The concepts and techniques described in this work can usefully be applied to solve a multitude of problems encountered by those investigating fracture and damage in materials, impact dynamics, metal working and other areas. Specific chapters focus on energetic materials, polymers, bulk metal glasses, and the mathematics of shear banding as well as the numerical modeling of them. With its detailed coverage of the subject, this book is of great interest to academics and researchers into materials performance as well as professionals. For mechanical engineers, materials scientists and academics involved in any aspect of fracture mechanics. Bradley Dodd is an Emeritus Professor at the Institute of Shock Physics, Imperial College. His research interests are metal forming, dynamic loading of materials and adiabatic shear, explosives and fracture of metals. He has published 3 three books (two co-authored and one co-edited). He is a founder member of the Light Weight Armor Group and is a long-standing DYMAT activist. He has helped shape the research strategy of the Institute of Shock Physics. Outside of Physics and Engineering he is a devotee of West Coast Psychedelic Electric Rock Music.